Members of the group used Forms as a homework tool in two ways: to check understanding of recent learning, or as a tool to enable flipped learning (reading or watching the essential subject content before the lesson starts). As an example of the latter, this Minimalist Music Form acts as an introduction to the topic. Although the questions are closed and fairly straightforward (and self-marking), it ensures students have at least watched the YouTube clip before the lesson has taken place. This way, discussion can happen as soon as the lessons starts. In terms of assessing understanding, Google Forms offers an alternative to Socrative and Kahoot, but works in a similar way. The big difference however is that the Form doesn’t need to be ‘open’ for students to complete. As long as students have the URL, they can complete at any point during a lesson (or before/after), and could even complete multiple times to demonstrate progress over time. 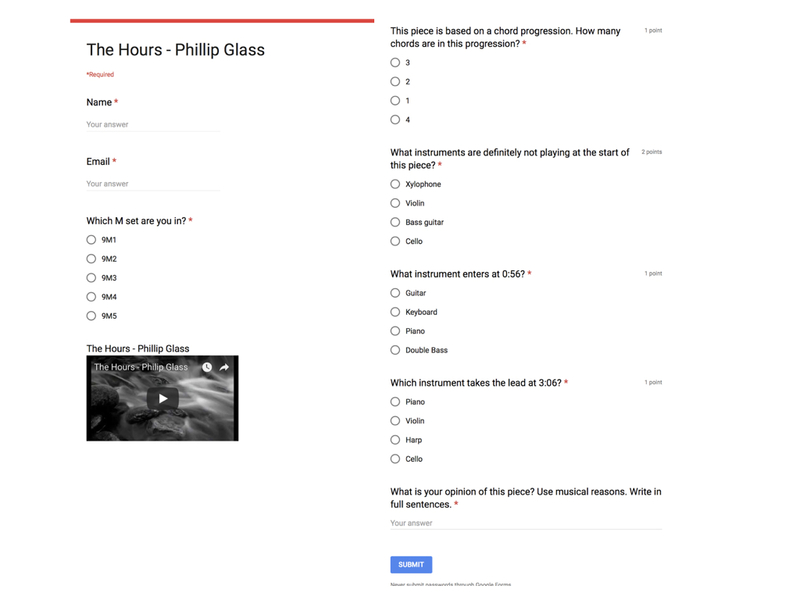 Our group also used Google Forms to enable students to give feedback to another group. One particular form asked students which group they were reviewing, how effective their response was visually, how effective the reading of the poem was, and to detail a WWW/EBI. A similar form could also be used to enable the teacher to give quick feedback to multiple groups by simply submitting one response per group. Finally, I used Forms to complete a Skills Check for my Y11 GCSE Music students in preparation for their listening exam. 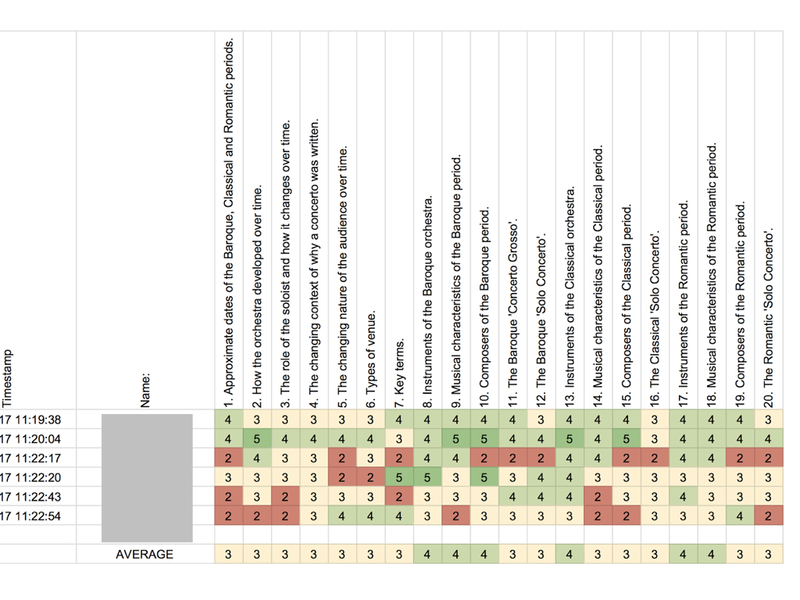 The questions asked the students to assess their knowledge/confidence for each skill or topic area using a rating scale (1 for “I know nothing”, 5 for “Very confident”). 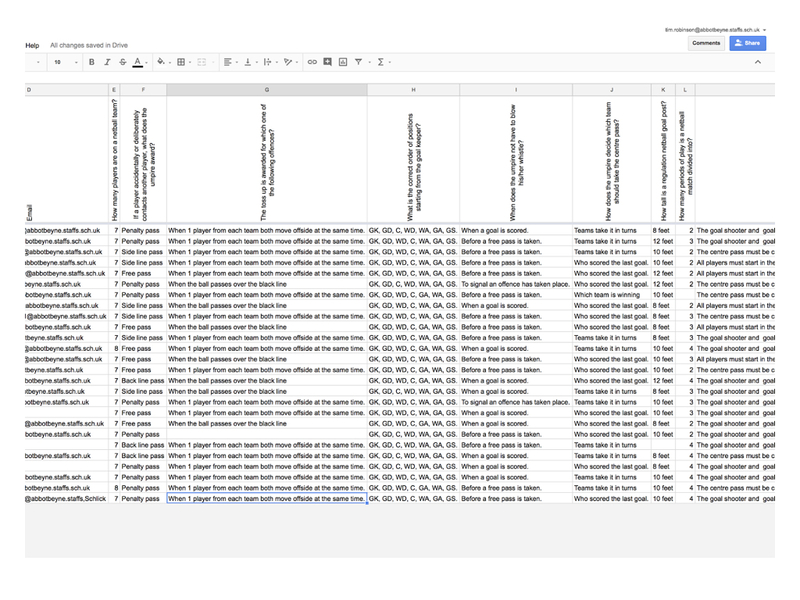 I then downloaded the results, inputted some conditional formatting and could use the Google Sheet as a clear indicator for which topics needs addressing.